In the northern parts of the country, you have two approaches to planting summer bulbs such as Canna, Gladiolus, and Dahlia. Start Indoors For Early Bloom - For earliest bloom in the northern zones, start these roots or bulbs indoors about 4 weeks before the last spring frost. This technique works best for larger Cannas, large-flowering Dahlias, Elephant Ears, and just any other summer bulb you want to have in flower earlier. Plant the bulb or root in 6 or 8 inch pots using a soilless mix. Whether your bulbs are from last year’s garden or newly purchased this year, plant them so that they are just completely covered, roots down. Do not plant them too deeply. It is better to err on the side of too shallow. Once the bulbs are planted, water them well. This is the signal to the bulb that “dormancy time” is now over and it is time to get a life. At this stage, you don’t need to give your bulbs any light so keep them in the basement or some other place that is not cold. As soon as new growth pops up treat them like houseplants and move them into good indirect light, not direct sun light. Keep them watered, but allow them to dry out between waterings. Twice a month, apply a water-soluble fertilizer at half strength. You don’t want to put these plants outdoors in the ground until your soil temperature is 65°F, but you can put them outdoors a week or so before that time during the day as long is it gets no colder than 50°F. This will get them accustomed to the outside and when they are finally planted into the soil, they can let it rip. Plant Outside For Normal Timing - The easier method is to simply plant summer bulbs or tubers directly in the ground well after danger of frost is past and when the soil temperature is at least 65°F. This will be about the same time for planting corn and tomatoes. In some cases in the more northern areas, this approach might lead flowers coming late in the season or even be missed. If that happens, then next year you will want to start them first indoors. It's not too early to be thinking about planting spring-flowering bulbs. I start planting in October, but now is the time to mark the planting spots in the garden that will be left bare when annuals are removed. This year, I'm using bamboo skewers to mark the spots. These long, thin sticks are easily shoved deep in the soil and stay put until I finish planting, unlike Popsicle sticks. And, bamboo is slow to decompose, so they can be left in place over the winter. When planting a variety of bulbs, such as daffodils, tulips and crocus, the sticks can be easily color-coded using vegetable dye purchased in the cooking section of the grocery store. Using a tall, narrow vase or water glass, mix a tablespoon of dye with a couple ounces of vinegar. When the porous wood has absorbed the dye, remove the sticks and spread them out on newspaper to dry. Jell-O also can be used to dye the skewers. Just add enough vinegar to bring the level of the liquid to 4 inches in the glass. Bamboo skewers can be purchased at most grocery stores, but I found mine bargain-priced at a dollar store. You don't need to plant hundreds of spring-flowering bulbs to make an impact. I plant in groups of six, spacing the bunches 2 to 3 feet apart. Six clusters make quite a splash in a gray spring landscape. Because I treat my tulips as annuals, this year I'm going to experiment with planting early varieties directly into the grass. These early bloomers will be up and blooming before the grass needs cutting, and when the blossoms are spent I'll just cut the tops off. To plant, I'll sink my narrow-bladed poacher's spade into the turf, rock it back and forth, and (drop)in a bulb. When mixing more than two colors, I increase the numbers in my clusters from six to 12 to get a good color mix. If you make up your own color blends, be sure the bloom times of the bulbs match so they all flower at the same time. If the word “bulb” came up in a word association test, nearly anyone would immediately respond with “daffodil,” “tulip,” or “crocus.” But this group of plants is something of a catchall category that contains more than just the spring-flowering species with which we are so familiar. ‘Bulbs” includes plants that grow from true bulbs –lilies, daffodils, tulilps, and hyacinths to name a few. But it also includes ones that arise from corms (such as crocuses), rhizomes (cannas), tubers (tuberous begonia), and tuberous roots (dahlias). Hardy vs. Tender Bulbs - To confuse matters even further, bulbs are often grouped into two general groups: hardy bulbs and tender bulbs, a distinction made on the basis of the plant’s ability to survive the winter outdoors all year round. Hardy bulbs, such as daffodils and crocuses, can be planted and left in the ground year after year, exactly like perennials. Tender bulbs can’t withstand northern winters and must be dug up , stored indoors and replanted in spring after danger of frost has passed, much like annuals. While rummaging in the basement looking for Christmas decorations I happened upon a bag of spring flowering bulbs that got stuck away by a mistake. I’m not alone here. All winter I get emails from readers asking if there is any way they can plant their overlooked treasures, short of using a blow torch to thaw the frozen ground. First I recmmend checking to see if the bulbs are in good condition. No use toiling over bulbs that are over the bend. Healthy bulbs will be firm to the touch, like a bulb of fresh Some may have already begun to sprout, but lack of green does not indicate they are doomed. Scott Kunst of Old House Gardens in Ann Arbor, purveyors of antique flowering bulbs. As long as the soil is not frozen at the final planting depth they can still be planted. We often plant spring flowering bulbs in our demonstration gardens in December. Kunst says the larger bulbs, such as tulips and daffodils do just fine. However, crocus and some of the other small bulbs need to have their roots established before the ground freezes so they may fail to flower when planted out late in the season. Brent Heath, co-owner of Brent and Becky’s Bulbs (website and Facebook page) suggest potting up these little guys and giving them some transition time in a cool corner of the basement or an unheated attached garage where the temperatures range between 40 and 60 degrees. After about three weeks the bulbs should have developed a nice root structure and the cell walls will have made the chemical changes needed to withstand freezing temperatures. At this point bulbs stored in the basement can be moved to the garage. As added insurance the potted bulbs stored in the garage can be packed up of Styrofoam coolers or cardboard boxes filled with foam peanuts. The insulation will protect them from swings in the temperatures. If you choose to move them outdoors place the pots on the ground in a protected area and cover them with 8 to 12 inches of mulch. Shredded leaves, pine needles or wood chips all work well. Covering the pile with a tarp or sheet of plastic netting will keep the mulch from becoming airborne in stormy weather. Tulips need between 12 to 16 weeks in the cold in order to bloom. 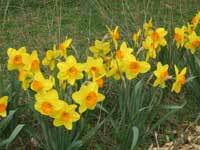 Most daffodil cultivars require 14 to 16 weeks. In spring the bulbs can be transplanted in containers for use outdoors or indoors. This method will work for the gardener who only has a few bulbs to contend with, but what about the poor souls like my friend Darby who cornered the market on bulbs early in the season and never got the chance to plant them. Digging in frozen soil or potting up are not good options when you have seven hundred bulbs to plant.” she cried. So I suggested she might try the quickie planting method used by another friend Rick Wray of Pennsylvania. He received a gift crate of bulbs the third week in December 2002, just two days before he was to leave on a cruise. With no time to plant them he simply tossed the bulbs on the ground and covered them with several inches of mulch. The following spring he was greeted with an incredible display of color. Don’t worry if the bulbs land upside down or on their sides. They know which way is up. The only hitch may be the weather. Ray’s neck of the woods is located in Zone 6a to 7 and Darlin Darby digs in Zone 5. Brent Heath thinks there is a good chance that tulips and daffs can survive being dumped out in the cold and thought mulching the bulbs was worth a try in this colder zone. Heath was more concerned about critters than the cold. 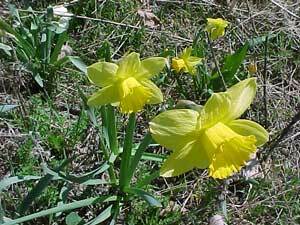 Bulbs that have not been buried in the soil are vulnerable to animal damage so it’s a good idea to take precautions. 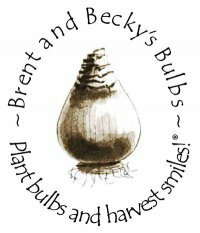 In their books Tulips for North American Gardens (Bright Sky Press $24.95) and Daffodils for American Gardens ($24.95) Brent and Becky Heath recommend spraying the bulbs with an animal repellant such as Ropel. In addition, scattering a thin layer of Milorganite (website and facebook page), a slow release fertilizer made of sewage sludge, around the perimeter and over the surface of the mulch bed will also help to deter animals. If you’re planting well away from the house in a naturalized location where you don’t plan to establish a garden, used kitty litter from the cat’s pan scattered about will also help to repel little 4-legged creatures such as voles that love to dine on bulbs. Granular PlantSkyddis formulated to repel all 4 legged creatures. Planting spring bulbs in heavy clay soil laced with roots and stones is a backbreaking job so my dream of installing a river of daffodils in my meadow and at the edge of the forest that surrounds my patch, was a long way off. But when a huge dump truck got stuck in my meadow leaving deep ruts, I took advantage of the situation and filled the depressions with daffs. Milorganite. While deterring critters, it also replaced any nitrogen that may have depleted as the wood chips decomposed. When life gives you lemons make lemonade. I am happy to report the daffodils thrived and have multiplied to the point they need to be divided after blooming this spring. .